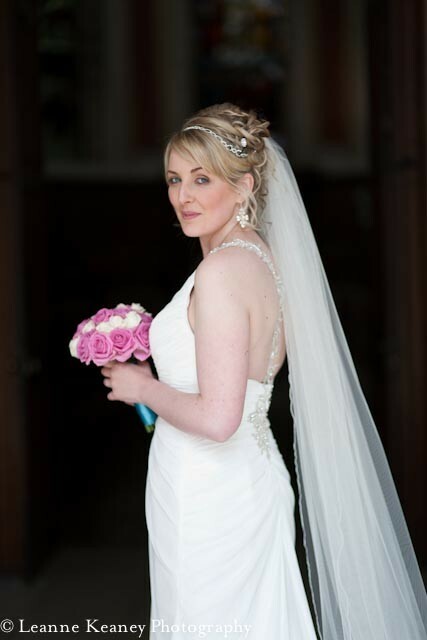 Adrienne Taylor is a freelance bridal makeup artist with over 20 years experience in wedding make up. 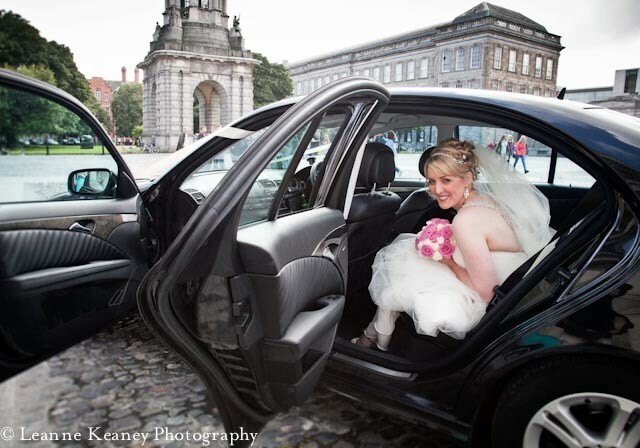 Adrienne is based in Dublin but travels nationwide to make brides beautiful from the comfort of your own home or wedding venue. 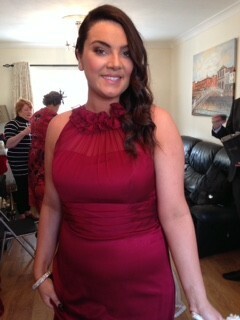 Hi Adrienne I would like to thank you for doing my make up so beautifully for myself and my three bridesmaids. 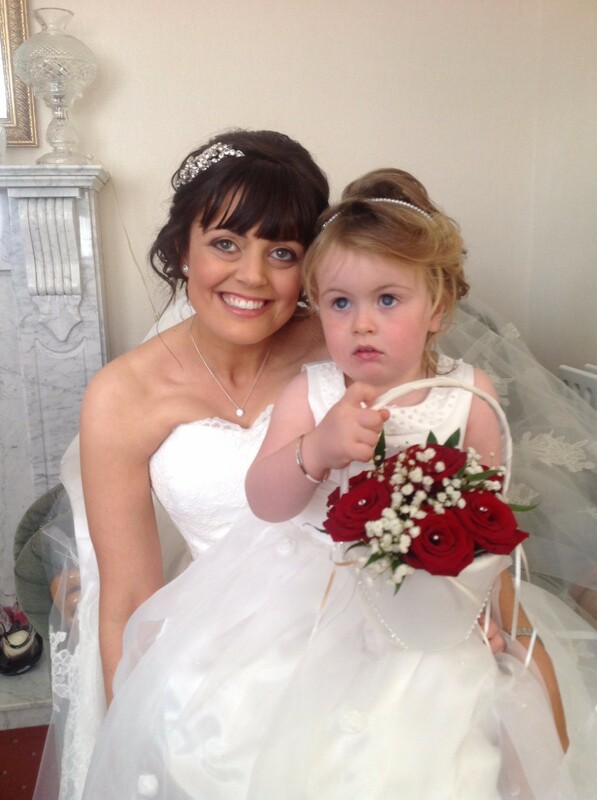 You made me look & feel naturally beautiful, my bridesmaids were gorgeous & my mother looked elegant. The makeup lasted the entire day. You made us all feel very relaxed. We were all delighted with the results! If you want to say this after your wedding day then get in touch. 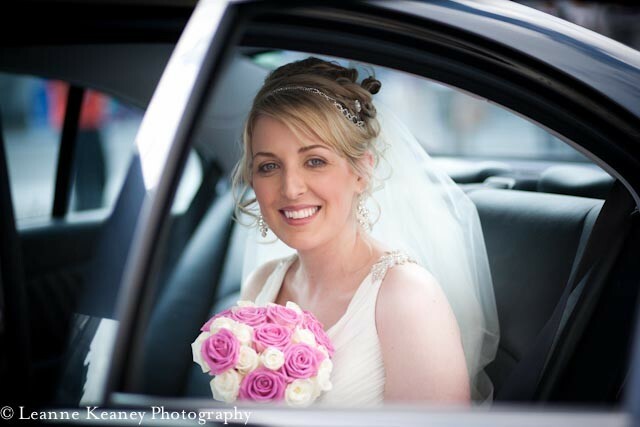 Adrienne and Sinead are the perfect professional hair and make up duo for your wedding day. For my mums 80th birthday, Adrienne did her make up and mine. She was warm, friendly and really understood our needs. We were both gorgeous heading off. Delighted with ourselves, would definitely recommend. Recently Adrienne and Debbie did my hair and makeup beautifully for my bridal party and I. I can't thank them enough for creating my dream hair and makeup on my big day. Adrienne did my makeup very elegant and natural just like i had asked her to do so and many more. She had past my expectations and blew me away with her talented work. Adrienne was recommended by by one of my bridesmaids who got married 3 years ago and adrienne also made her feel just as beautiful as I did. Adrienne and Debbie make a wonderful team, they work very well together and made us feel very relaxed and comfortable on the morning of my wedding. Debbie did a soft romantic upstyle and also did an fantastic job. I couldn't recommend them both highly enough. As mentioned in my review for The Hair Mob, I am doing this review as I chose Beautiful Faces because of the great reviews and I was disappointed. Unfortunately, of the six people that got their makeup done five were disappointed for various reasons. All of the bridesmaids had to put on more foundation after Adrienne did their make up and none of these girls usually wear heavy make up. The blusher was bright and almost looked old fashioned so they had to tone it down. Eyebrows were not filled in and for me eyebrows are very important to frame the face!! One girl had to redo her eyeliner as it was done with a dull pencil. Our foundation was all done with the same brushes and the makeup artists fingers! One of the girls has very sensitive skin so her own make up and brushes were used but we still paid full price. I have also never heard of a makeup artist not sticking on lashes. When I got into my dress I noticed a scrape on my chest, I asked if she could cover it up and her response was ‘no the stuff is in the car’. The last two people were rushed due to bad timing. I wasn’t expecting miracles but my make up didn’t last long at all. The coverage wasn’t great, you could see pores and by dinner time it was coming off. All the wedding guests that had their make up done in places like Inglot looked fab and their make up lasted for the whole night. All in all unfortunately I couldn’t recommend Beautiful Faces. Hello Ciara I am responding to your review for ‘Beautiful Faces’ on WOL and have to let you know that your critique was very upsetting for me. Regarding some of the critical points you made I would like to emphasise that I specialise in creating a natural look and regret that your bridesmaids were not happy with this and felt the need to apply further coverage. In addition, if the bridesmaids felt that the blusher was too bright they could have made that point at the time and I would have been happy to apply a more faded tone. Again if you had mentioned at the time that the finished eyebrow look was not satisfactory from your point of view I would have been more than happy to make any adjustments to suit. In one way this defeats the purpose of employing a makeup artist at all but different people may have different requirements. All eyeliners/duos used were professional products (Smashbox Brow Tech) MAC and Make-up Forever and not dull pencil as noted in your review. I also advised you beforehand, by email, that I didn’t do false eyelashes. I always advise brides and bridal party to have them done during the week of their wedding or day before and to make sure they have a patch test done beforehand so they don’t have a reaction to the glue. It appears that you thought I used the same foundation brush for each girl whereas I had seven individual foundation brushes with me and used a separate one for each girl and always ensure I adhere to hygiene standards when applying makeup. It was unfortunate that one of the girls has very sensitive skin but you will appreciate that it was safer to use her own products and brushes in a case like this to ensure that she did not get any allergic reaction. I also did give you a special price offer for the bridal party. In relation to the scrape on your chest, I pointed out to you at the time that if I applied concealer to the scrape it may transfer to your wedding dress which I’m sure would have been upsetting for you. I did arrive on time and I regret that you thought any of the applications were rushed due to bad timing and that in your own case the makeup did not last and appeared to be coming off. You will recall that you had a makeup trial with me in advance of your wedding day and made the booking with me as a result of the trial. I can only assume therefore that you were pleased with the outcome of the trial makeup and were aware of my specialist area of natural look. I have been providing this service for 20 years now and in one way am reluctant to let you know that in all of that time yours is the first negative review I have ever received. Adrienne did my make-up and the make-up of my bridal party and friends (8 persons in total ! ), and we were all really happy about the results ! During the trial, Adrienne found exactly the good foundation colour, tried different eyeshadows to realize different make-up effects. Just perfect for me, because I was not sure what I really wanted ! The make-up on the day was stunning, and realized with very good quality products. No need of a single touch-up during the day. I also really appreciated that Adrienne could adapt the make-up style depending on my friends, who all had different requests or expectations. Adrienne and Debbie did my make-up and hair for my recent wedding. I found them both brilliant. Adrienne did an amazing job on my make-up. It was so natural looking with lovely smokey eyes. I didn't touch it all day apart from doing my lips and it didn't fade at all. Debbie did an amazing up-style on my hair that literally brought me to tears. I got loads of compliments on the day re both. They are both really professional but also great value for money. They are so calm and relaxing and provided me with with some great tips to keep me calm throughout the morning! They were a pleasure to have in the house. They also did my sister's make up and flower-girl's hair which were really lovely also. High recommend! Adrienne is a lovely lady and talented make up artist. She arrived in plenty of time on the day and wasn't in a rush to head off either! Staying for the final touch ups. The make up was lovely, natural but with enough cover and lasted wonderfully the whole day and night. Thank you Adrienne! 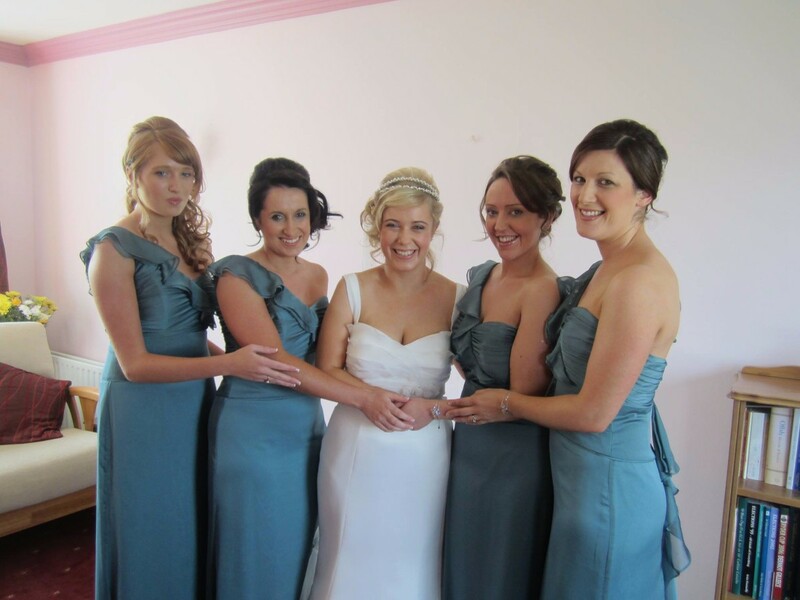 Review by Leanne - Julie's bridesmaid! 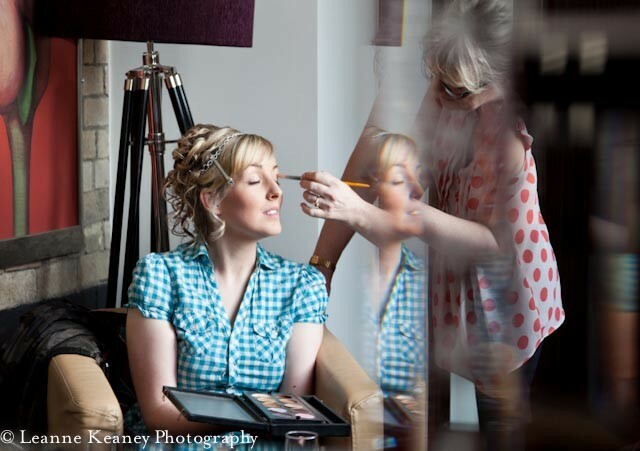 Adrienne is a wonderfully professional, relaxed and skilled make up artist. Her calm demeanour & casual chit chat eased everyone into the day & the make up turned out beautifully. I can definitely say that everyone looked like the best possible version of themselves & the bride & bridal party received so many compliments throughout the day. The make up really lasted for the entire day & through the dancing - I would thoroughly recommend her! Adrienne is fantastic. If you want natural looking make up that looks great in reality and in your photos then this is the lady for you. She did my make up for my own wedding nine years ago. She did my make up when I was bridesmaid for a friend five years ago and she has just done my make up as I was bridesmaid last week. The fact that I keep going back to her is testament to what a great job she does,. The make up is perfect,. It lasts all day. 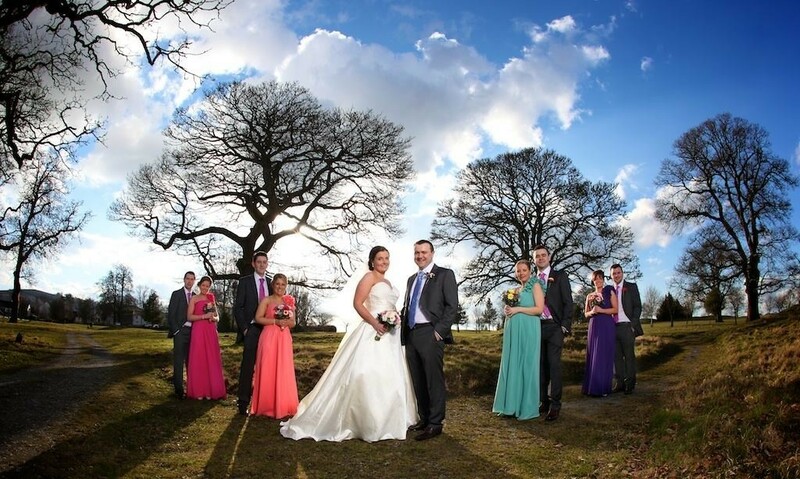 She is extremely friendly and relaxed and blends in fantastically in your house the morning of the wedding. I cannot recommend her highly enough. 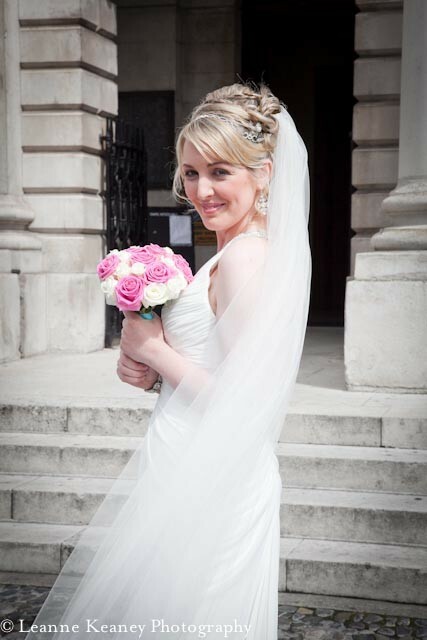 Hi Sinead, I just wanted to say a huge thank you for the amazing job you did with our hair on the morning of my wedding. I absolutely loved my upstyle and got so many compliments. Thank you also for doing such a great job on both of my daughters hair at such short notice. Even though they had not been booked in originally, you were so accommodating and they both looked amazing for the big day. I have to say yourself and Adrienne made us all feel so relaxed with your calming presence. I can't thank you both enough for making me feel and look so beautiful for my day. I look amazing in my photos (something every bride worries about) I wont hesitate recommending you both to brides looking for the best hairstylist and make up artist for their big day.Thank you so much again. Hi Adrienne, I want to thank you for everything you did for me on the morning of my wedding. It really was like having a family friend around. You were so calming and helpful. My daughter loved how you pampered her too while you were waiting for me to be ready. She loved how you did her make up and made her feel special too. My make up as expected lasted the whole day ( it was still perfect at breakfast the next morning) I got so many compliments on how I looked. You knew exactly what colours would suit me and I will now go shopping for new make up (you were so right) Thank you also for the spare lip stick you gave me if I wanted to reapply during the day, it came in handy after the meal. Adrienne I would have no hesitation in recommending to anyone needing a make over for their big day who is looking for the best. Thank you so much again. Hi Adrienne I would like to thank you for doing my make up so beautifully for myself and my three bridesmaids. You made me look & feel naturally beautiful, my bridesmaids were gorgeous & my mother looked elegant. The makeup lasted the entire day. You made us all feel very relaxed. We were all delighted with the results! Thank you so much. Hi Adrienne & Debbie. What can I say, yourself & Debbie made me look & feel stunning, my bridesmaids were beautiful & my mother looked 10 years younger. The makeup & hair lasted the whole day. Yourself & Debbie made us all feel very relaxed. We were all delighted with the results! Thank you both so much. This is a very long overdue testimonial for Adrienne and Sinead. Together they make a great team, they made me and my two bridesmaids and my mam look and feel great on my wedding day the 4th October 2012. I'm very picky with regards to my make up and Adrienne took in everything that I wanted and I really never had my make up done so nice...I loved it. Sinead was brilliant and I really recommend the trial as you get to see what she is capable of and what look best suits you.You both did a wonderful job. I'm so glad I chose you both, you were both so friendly and made me feel much more relaxed. Hope to see you both some time in the future and I will definitely recommend your services. 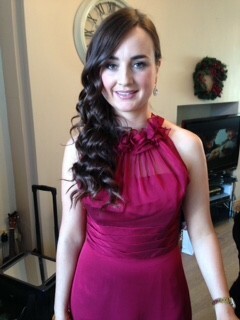 I just want to thank Adrienne and Debbie for the fabulous hair and make up they did on my wedding day on the 11th Jan. I can't recommend them highly enough. They were both so nice and reassuring and made the whole wedding morning a lot more relaxed and happy. If anyone is looking for hair and make up to be done in their home then look no further. Thanks again! A long overdue testimonial for Adrienne and Debby, who made me feel so special for my wedding say on Nov 8! 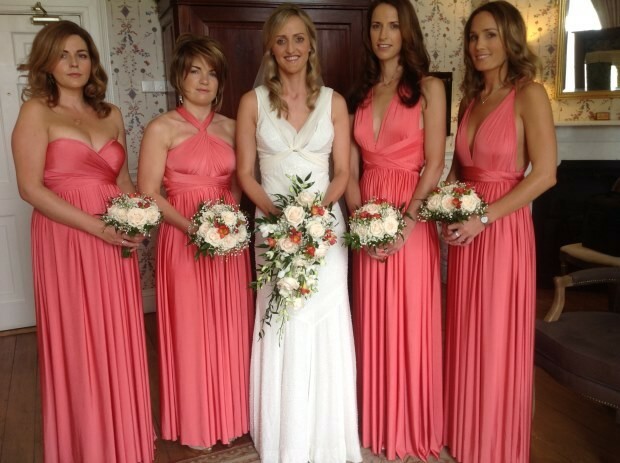 We got married in Castle Durrow and Debby and Adrienne travelled down to do hair & makeup for myself, my 3 bridesmaids and my mam. With the mass at 1pm, it was an early start to the day for us all, but we were all done and dusted with plenty of time before the mass. 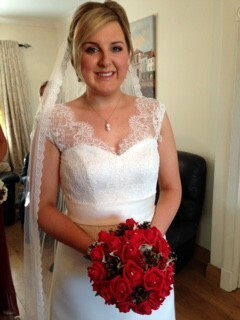 The make up by Adrienne was fab, stayed in place all day for us all, with virtually no touch up needed! I felt so comfortable with Adrienne after we did the trial run a few weeks before; so I knew that she knew exactly the look I was looking for & she certainly delivered on the day! Debby has such an unbeliveable touch with hair that she knows exactly what you are after and what might suit you best. Even if you don't know what you are after she can look all the girls and the style of the dresses and come up with something fab for you. I didn't want the bridemaids to look the same, so they all could decide themselves how they would like their hair, and Debby did a wonderful job in making it all happen. 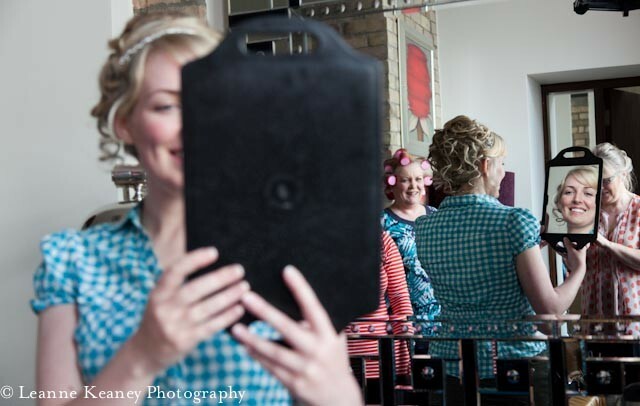 Thanks so much for doing such a brilliant job & making the day get off to such a fun and calm start!.....Any brides out there looking for hair and makeup should look no further! I discovered Adrienne through a glowing recommendation from a friend. From the beginning, I found her to be a professional, easy going and a highly skilled artist. During my make-up trial, she spent the morning sampling different shades and products on my skin to see which ones suited best. She described in detail each product she used and the effect it would create. Adrienne had a lovely, friendly manner and I knew that she was someone who would be a calming and positive influence on the morning of my wedding. 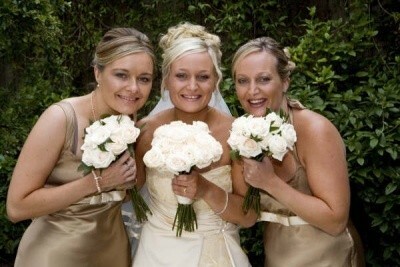 On the wedding morning itself, her friendly presence quickly put me, my mam and my sister at our ease. She worked with a deftness that made me feel I was in the safe hands of a consummate professional. And with all the chatting and good humour I soon forgot the nerves I had woken up with that morning.Throughout the day people commented on how beautiful I looked. Browsing through photos since then, it was clear that the makeup remained perfectly intact all day. I even looked fresh-faced and elegant into the wee small hours of the morning. I couldn't recommend Adrienne highly enough. She created a natural, elegant effect with my make up and I looked radiant throughout the day. I am so very grateful to her for her expertise and experience. Any bride would be very lucky indeed to have Adrienne as her make up artist. From the moment i met adrienne at a bridal fair i got a good feeling from her, she was open and honest and so friendly she had me so comfortable in such a short space of time. My wedding was over a year after i met her but she never left my head and when the time came to book a trial she was the only one i called. The day we went to her house for a trial was fab, again made me and my bridemaid so welcome and we chatted like we had known each other all out life. She told me from the start to be honest and speak my mind so she knew what i wanted.. i didnt have to tell her much she just knew what to do to suit my colouring but also my dress style and hair piece. My trial lasted well over and hour, when finished i knew i didnt have to try someone else i booked her straight away. She kept in regular contact and when had trouble finding the lipstick she was going to be using she offered to get it for me. On the day of the wedding she turned up early and straight away was chatting to everyone and making them feel relaxed. The 2 mothers dont normally wear alot of make-up so she was subtle but they looked fab as for the bridemaids well they were just mad about theres and kept saying so. Then it was my turn and i thought my trial was fab but she went the extra mile on the day and i was soooo trilled with my look and looked amazing - if i say so myself !! Having Adreinne as my make-up artist was one of the best decision i made in planning my wedding and would totally recommend her to anyone out there. The only thing that killed me was taking it off in the realy hours of the morning as i knew id never have it looking so good again!! Thanks so much for making me look a million dollars on such an important day and if i ever have a special occasion that i need my make-up done for ill be straight onto you. Adrienne had previously done the make-up for one of my friends and I didn't hesitate to book her for my own wedding on June 30th, 2012. Adrienne recommended Debbie as hairdresser. They were a pleasure to deal with from the outset. On the day itself, they were so calm and had us all (bride and 3 bridesmaids) completely relaxed. I knew they would do a great job, but they went beyond my expectations. 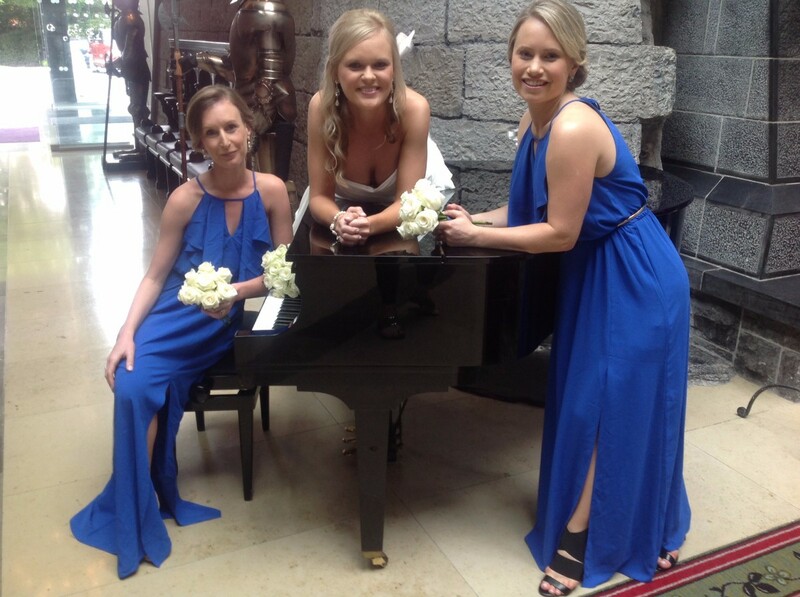 The bridesmaids and I could not have been happier with our hair and make-up. 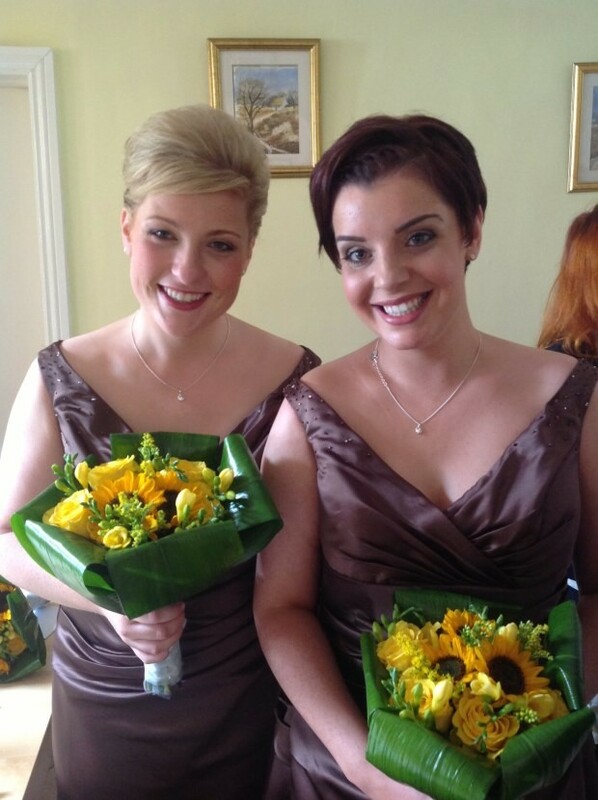 Countless guests commented on how natural our make-up was and how fantastic our hair was. I can't express how happy I was - I would most definitely recommend Adrienne and Debbie to anyone looking for an excellent service from start to finish. I contacted Adrienne after reading some great review on this website and I was not disappointed. Adrienne is a lovely lady, very down to earth, relaxed and we immediately hit it off. I had a 2 hour consultation and trial which is essential. Adrienne talked me through the different stages and what she was applying. The make-up she uses feels very light on your skin and as someone who doesn't normally wear make-up this was such a relief for me. I didn't look 'caked' in make-up. Sinead already had a booking for our date so Adrienne recommended Debbie another lady who she works with. Again we had a trial, my 2 daughters (aged 6 & 9yrs) and my mum. Debbie is an artist. She is so creative, works very quickly and makes it look so easy. Again the fact that she is so professional and bubbly made the whole experience lovely. 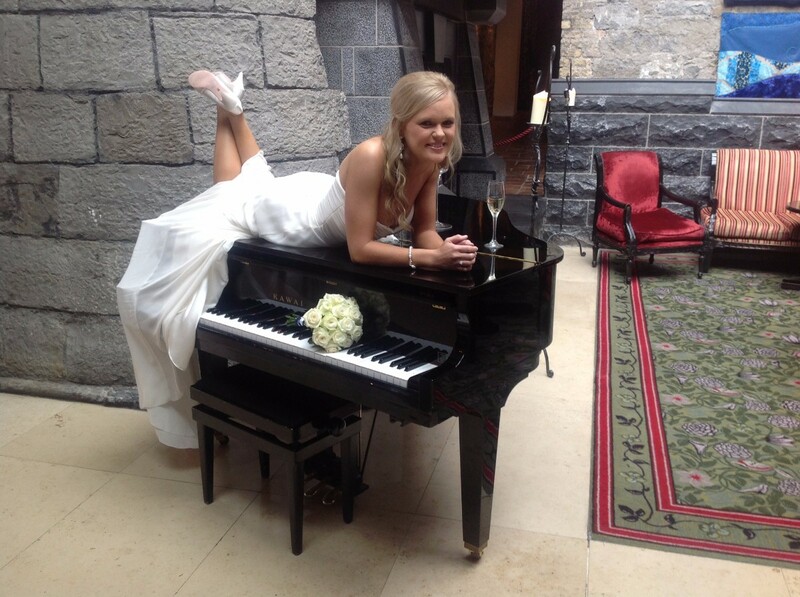 On my wedding day, Adrienne and Debbie travelled to our venue in Wicklow. They were both there on time, relaxed, organised and had planned plenty of time to make-over my mum, best friend, 2 daughters and myself. I have to say I loved the whole experience, and our girlie morning getting ready together was very special part of the day and a memory I will never forget. It was so peaceful, we could here the water flowing in the fountain below our bedroom, the girls expertly transformed us one by one and we had a giggle too. No-one was stressed out, rushed or under pressure and we all looked stunning. Our hair and make-up lasted throughout the whole day (and night) and my daughters looked like princess (and age appropriate too!) I cannot thank Adrienne and Debbie enough for the wonderful job they did and for being part of our day. I would highly recommend them to any bride. Don't Miss This Wedding Makeup Special Offer From Beautiful Faces!